My 3 Top Sensible Tips On Updating a Guest Room for Christmas. December is very nearly amongst us, and for many of us, presents, decorations and food are on our minds. We've double and even triple checked our list of people to buy for, because forgetting your least favourite sister in law is acceptable for you, but not a great look to the wider family. We're jotting down foodie items on our Christmas food shopping list as and when we think of them, but no doubt we'll still forget something important, like the Christmas pudding, and we've already got our Christmas day outfits sorted, well I have - priorities right? Christmas is a time of giving, eating, relaxing, and for some of us even entertaining. If you're one of the brave people out there (like me) who has offered to host the festive season at your house, then your lists go far longer than doing the Christmas food shop, and making sure everyone has a present or two that they're going to love, because is there anything worse than unwanted Christmas presents? Your planner has suddenly gone from a beautifully presented planner that's very nearly lasted the whole year looking rather presentable, to looking like a sad little book who's lost its way in life. Gone is the effort of adding little cute speech bubbles and notes, and in comes the scribbles, the ripped out pages, and even the tip-ex, because you're desperately running out of page room and even pages after ripping so many out. 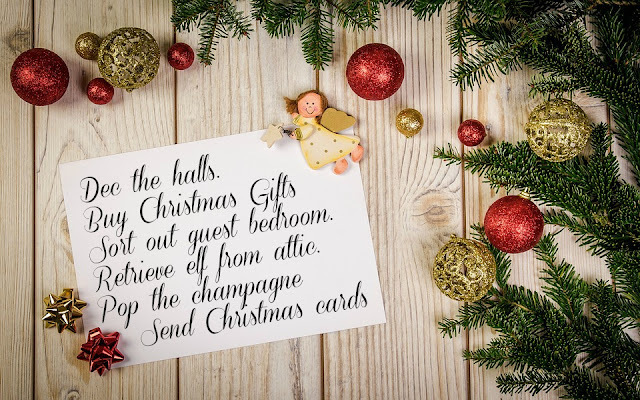 You thought it would be a great idea last year when you offered to have your best friend and her husband over for Christmas, you've had a whole year to plan - you've got it covered right? Well if you're anything like me, you're far from sorted, I mean, I've hoovered the carpet in the guest bedroom, and I've moved some, yes some of the boxes out of the way, but as for everything else - well, I've got a busy few weeks ahead haven't I? There was me hoping for a stress free Christmas! The plans I had - I wanted the room not only decorated but plastered too! I wanted a new bed in there, new blinds up on the windows, and even a new boiler cupboard door. HA! That's just a few of the major things I wanted, let alone all the smaller bits - that now seem huge themselves, yet I've got list after list pegged onto the peg board, my handbag resembles a bag that's not been emptied for years - and as for my head... well, that'll need a whole new post in itself! Instead, as usual, I've left everything to the last minute. December will be here tomorrow, and I have so much to do (not just the guest bedroom but about 400 presents to buy too...) so if you're like me, a procrastinator at its finest, here are some sensible tips which I hope will help you and ME! 1. Buy a Robot - Hire a Cleaner. I know, I know... money is tight, but so is time. Time is precious right now, and instead of spending loads on the decorating if you had those plans like me, hire a cleaner for a few hours instead. Local cleaners I've seen advertise charge anything from £8-£11 per hour for a one-off clean, money well spent if you ask me, hiring a cleaner not only takes the pressure off me, but it gives me time to search for much-needed items to make the guest bedroom more welcoming. Can you afford a whole new bed and bedroom furniture set this close to Christmas? I know I can't, and if you can't either, then don't worry. We can totally transform a room on a budget, maximising the welcoming feeling using just accessories! I've picked up some bits from Julian Charles, my local selling sites and even my sister's garage (one man's rubbish is another man's treasure, so they say) to give my guest room a new lease of life. 3. Don't Be That Person Again Next Year. Whatever you do, DO not offer to have Christmas at your house again. Let someone else take their turn, it'll be nice for you to have a break and not have to worry about all the cooking and cleaning that comes with Christmas, and if you're anything like me, staying at someone else's always feels like a little holiday! If you have any sensible tips, please do feel free to leave a comment letting me know!